I just Sous vide(d) a steak to perfection in three hours in a thirty year old rice cooker on "keep". There's a factory somewhere in Japan that's still turning out "old school" rice cookers. Or at least I figure there must be. It's either a factory that's still running, or a really, really big warehouse that's still full. You can still buy the exact same model as mine thirty years later. Perhaps they just left the factory running and forgot about it. My impression of the situation is that there was an order placed thirty five years ago, and someone rocks up in a truck every few hours at the loading bay, and collects the latest batch for drop shipping around the world. 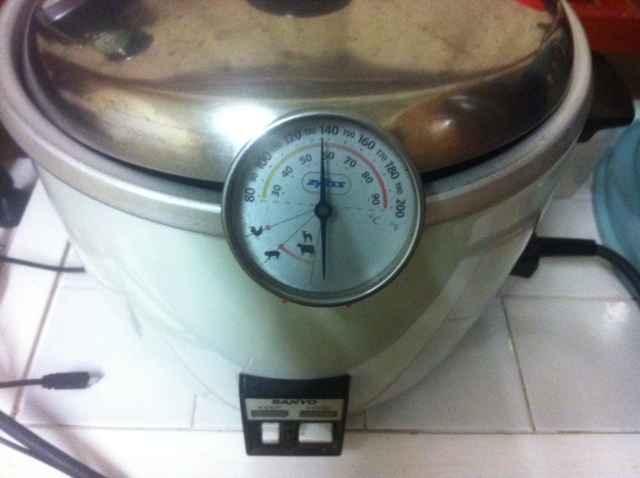 The rice cooker I'm talking about is the one I still use all the time, and looks like this. Actually it looks a little less like this. It looks like this, but without the meat thermometer I put under the lid. Interestingly it keeps an interesting temperature. If you happened to start by putting a quarter of a cup of water into it and set it to "keep" and "cook" so that it first cooks, then keeps, you will find that after the cook cycle has finished and it switches to "keep", you can fill it with hot water, and it will sit at around 57c. Now it turns out 57c is a very interesting temperature. You even get a bit of control. If you have a shallow depth of water you will get a slightly higher temperature, and if you fill it to the rim, you will get a slightly lower temperature. Get a rice cooker and make it be on keep and fill it with hot water. Then get a zip-lock sandwich bag, and drop a steak into it. Just make the steak stay dry. 1. Submerge the steak in a bag in the water until the pressure forms a nice tight compression around the steak(s) then seal up the bag. 3. Just leave the bag open, peg it to the side, and let the hot water in your rice cooker do it's thing with it's own pressure. Put the bag of steak into the hot water. Leave it there until you get bored. If you get bored in less than an hour and a half, leave it there until someone else gets bored. I didn't get bored until around three hours the first time. It looked like this when I fried it for twenty seconds on each side and cut into it. Yeah that's the same photo as above but I thought it was worth another look. 120 Things in 20 years doesn't cook steak the regular way any more, but still makes rice the regular way.